I was recently introduced to the wonder that is www.joggingjeans.com, which is a blog that consists of… well, people jogging in jeans. Which is preposterous, yet hilarious. Well maybe it’s not that crazy. I mean as kids, didn’t we play and run in our jeans all day, every day? It never seemed to bother us then, right? You never see a kid stop their fun and say ,”Wait guys. Let me put on some more appropriate clothing for running.” Nah, they just take off. Cross-trainers – When I first started running almost five years ago, I ran in an old pair of cross-trainers I had in my closet. It pained Donnie to see me run in these and he eventually bought me my first pair of running shoes when I started to complain of ankle pain. Street clothes – Recently my friends and I traveled to Cleveland, OH for a wedding. We had a layover in Atlanta. Due to bad weather and a delayed flight, we had less than one minute to get across the Atlanta Airport. Despite this being an impossible challenge, we tried anyways. Running in low-rise jeans, a regular bra and flats was a massive fail and my sprint quickly turned into a really slow jog. We missed the flight (not because of how slow I was, but because the plane had already left without us) and ended up sleeping in Atlanta. Street clothes (again) – When a friend was struggling during her marathon earlier this year I threw on my running shoes and started to run along side her for a little motivation. I’m so thankful that she said she was fine, because running in tweed shorts was sure to give me some massive leg chafing. 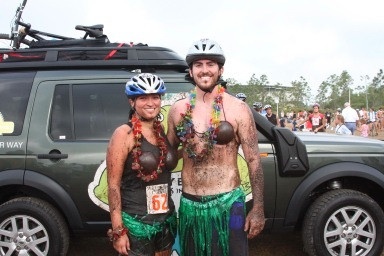 Around mile 3 we figured out that it was best to tuck our grass skirts into our shorts to avoid getting caught in the spokes. Wish we would've remembered to untuck for this pic. What’s the most ridiculous thing you’ve run in? Great blog. I’m now “following” and will be back! LOL. Awesome… Thanks! And thanks to you for bringing the laughs!